Ferjo was born Fernando de Jesus Oliveira in Bahia, Brazil. He is regarded as one of the most energetic and interesting artists in the modern day art world. His talent has earned him the esteemed Crescent Scholarship at the Pennsylvania Academy of fine Arts, as well as the New York Council for the Arts Award for Excellence in his portraiture work. 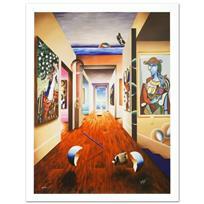 "Dining with Chaggall" Limited Edition Giclee on Canvas by Ferjo, Numbered and Hand Signed by the Artist. Includes Certificate of Authenticity. 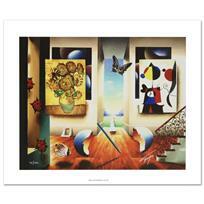 "Miro and Sunflowers" Limited Edition Giclee on Canvas by Ferjo, Numbered and Hand Signed by the Artist. Includes Certificate of Authenticity. 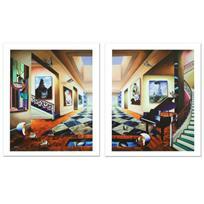 "Melting Time Across from Bridge" Limited Edition Giclee on Canvas by Ferjo, Numbered and Hand Signed by the Artist. Includes Certificate of Authenticity. 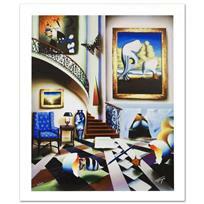 "Conclave of the Masters" Limited Edition Giclee on Canvas by Ferjo, Numbered and Hand Signed by the Artist. Includes Certificate of Authenticity. 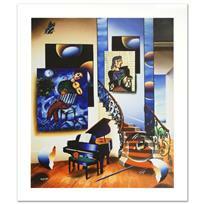 "Chagall's Recital" Limited Edition Giclee on Canvas by Ferjo, Numbered and Hand Signed by the Artist. Includes Certificate of Authenticity. 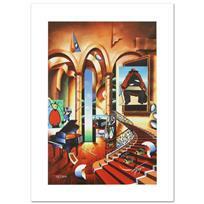 "Love in Paris" Limited Edition Giclee on Canvas by Ferjo, Numbered and Hand Signed by the Artist. Includes Certificate of Authenticity. 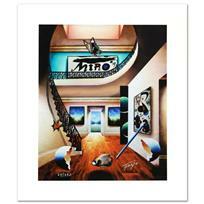 "Miro" Limited Edition Giclee on Canvas by Ferjo, Numbered and Hand Signed by the Artist. Includes Certificate of Authenticity. 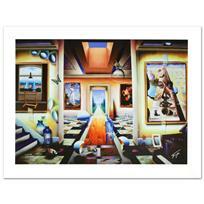 "Dreamlike Corridor" Limited Edition Giclee on Canvas by Ferjo, Numbered and Hand Signed by the Artist. Includes Certificate of Authenticity. "Eye of a Master" Limited Edition Giclee on Canvas by Ferjo, Numbered and Hand Signed by the Artist. Includes Certificate of Authenticity. "Serenity and Joyful Dance" Limited Edition Giclee on Canvas by Ferjo, Numbered and Hand Signed by the Artist. Includes Certificate of Authenticity. 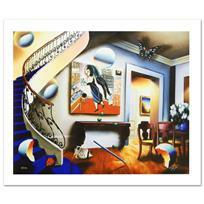 "Into the Garden" Limited Edition Giclee on Canvas by Ferjo, Numbered and Hand Signed by the Artist. Includes Certificate of Authenticity. 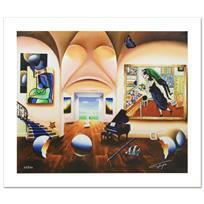 "Dreaming" Limited Edition Giclee on Canvas by Ferjo, Numbered and Hand Signed by the Artist. Includes Certificate of Authenticity. 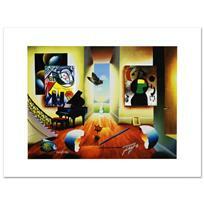 "Masters Musician Beginning" Limited Edition Giclee on Canvas by Ferjo, Numbered and Hand Signed by the Artist. Includes Certificate of Authenticity. 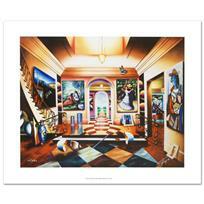 "Fiddler" Limited Edition Giclee on Canvas by Ferjo, Numbered and Hand Signed by the Artist. Includes Certificate of Authenticity. 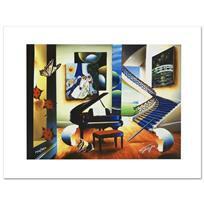 "Elegant Music" Limited Edition Giclee on Canvas by Ferjo, Numbered and Hand Signed by the Artist. Includes Certificate of Authenticity. 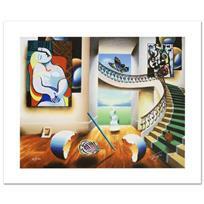 "Stairway to the Masters II" Limited Edition Giclee on Canvas by Ferjo, Numbered and Hand Signed by the Artist. Includes Certificate of Authenticity. 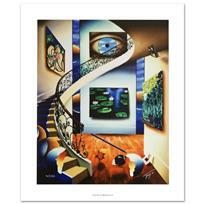 "Surrealist Stairway" Limited Edition Giclee on Canvas by Ferjo, Numbered and Hand Signed by the Artist. Includes Certificate of Authenticity. 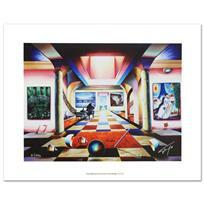 "Passageway to the Masters" Limited Edition Giclee on Canvas by Ferjo, Numbered and Hand Signed by the Artist. Includes Certificate of Authenticity. "Perfect Afternoon" Limited Edition Giclee Diptych on Canvas by Ferjo, Numbered and Hand Signed with Certificate of Authenticity. "Theresa and 3 Candles" Limited Edition Giclee on Canvas (30" x 40") by Ferjo, Numbered and Hand Signed by the Artist. Includes Certificate of Authenticity.